Introduction: There is a recent recognition that diabetes mellitus (DM) has the potential to reach epidemic proportions, with related implications for visual impairment, in India. A quarter of the world’s blind population is estimated to be in India, about 9 to 12 million. Awareness about the eye complications of diabetic retinopathy can play an important role in encouraging people to seek timely eye care and help to reduce the burden of visual impairment. Material and methods: We conducted a survey using a 20-point questionnaire among 1,000 diabetics who attended our outpatients department between October 2001 and March 2002. The questionnaire was devised to assess awareness about the eye complications of diabetes and to seek the opinion of patients about how awareness can be increased. Results: 86% of patients were aware that DM could affect many organs in the body and 84% knew that DM could affect the eye. Among those who were aware that DM could affect the eye, 36% came to know through the media, 32% from other eye specialists and 30% from their general practitioners or physicians. Among those who were aware that DM could affect the eye, 51% did not know exactly which part of the eye is affected, 28.3% thought that cataract was the main eye disease due to DM, and 19% thought that DM affects mainly the ‘nerves in the eye’ (presumably retinopathy). 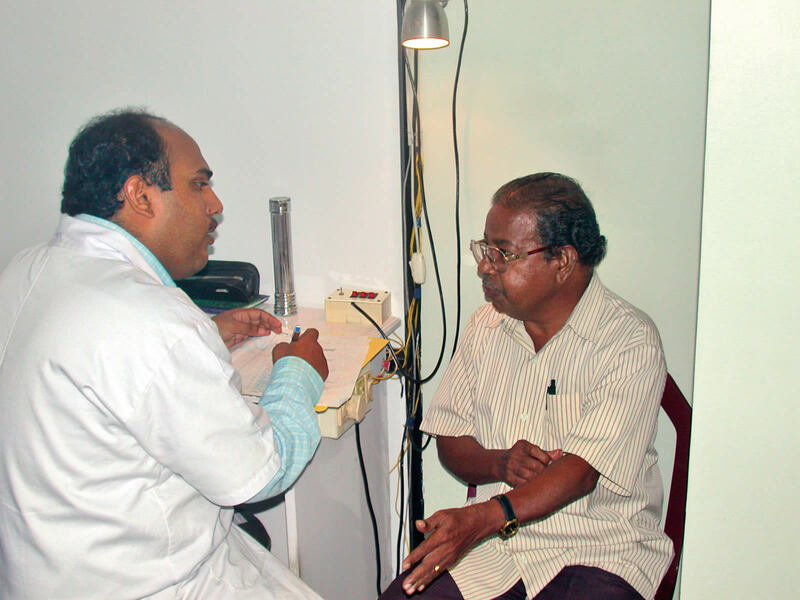 50.8% of the patients knew that routine eye check ups are necessary in spite of good control of DM, while the rest thought that if DM is well controlled, routine eye examination is not necessary. To increase knowledge, 36.8% suggested more media coverage, 32.7% suggested more information from treating physicians, 19.8% suggested more information from eye specialists and 10.7% suggested more information from health and paramedical workers. Discussion: It is very important to differentiate between ‘awareness’ and ‘knowledge’. Having just heard about a problem is ‘awareness’ and having an understanding about the problem or disease is ‘knowledge’. 84% of the patients were aware that DM could affect the eye. This shows that awareness about the complications of DM is quite high. But knowledge is comparatively less, since only 46.9% of the persons interviewed knew that retinopathy was related to control of DM while only 40.3% knew that it was related to duration of DM. This is also evidenced by the fact that among those who were aware that DM could affect the eye, 51% did not know what exactly the eye complications of DM are. It has been shown that population-based screening is not the ideal method for diseases with low prevalence like diabetic retinopathy. Diabetic retinopathy may occur in 23% of diabetics but only in 1.78% of the general population. Currently, in India, the approach to the problem of diabetic retinopathy should be case detection and not populationbased screening. For case detection, awareness and knowledge among diabetics are very important so that they come forward for routine eye examination. This survey is an attempt in this direction.